Whether you’re an Aussie, catching your first international flight or a seasoned traveller, here’s all you need to find us at YWAM Newcastle. Off street parking is available on the northern side of our office. 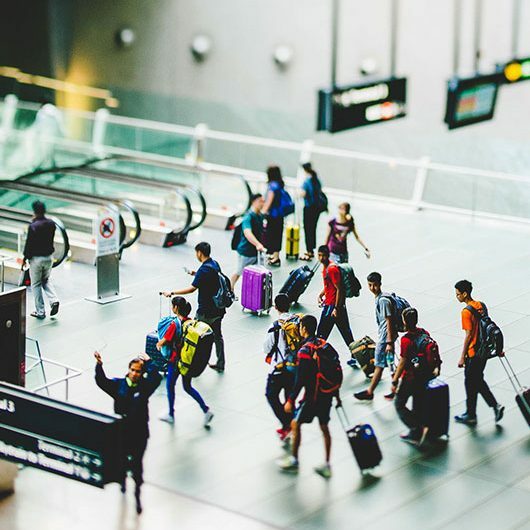 We recommend flying into Sydney International Airport as the Newcastle airport is some distance from town and less accessible by public transport. At this stage, we do not offer a shuttle service from Newcastle Domestic Airport. If flights into Newcastle airport are significantly cheaper, please contact us and we can discuss options. To plan your trip in advance please visit: Transport NSW or download the Opal Travel App. You will be travelling from Sydney International Airport, Mascot to Waratah Station. When setting the date and time of arrival, please allow enough time for you to get through baggage claim and customs in Sydney. Make sure to save or print these directions before you leave for Australia. My Plane Has Landed & I’ve Got My Luggage, Now What? 1. Once you clear customs exit to your right and follow the signs towards the train station. If you have time, please access the free wifi and let us know that you have arrived. 2. Follow signs until you reach the escalators/lifts, this will take you down to the station. There’s a bathroom by the escalators if you want to stop and freshen up. 4. Using your Opal Card, enter the station and catch the train to Central Station. Trains run every 10 – 20 minutes so you shouldn’t have to wait too long. The trip to Newcastle usually takes 2.5 – 3 hours, so make yourself comfy. If you have time we recommend grabbing some snacks for the trip. Please note: all city trains have a quiet carriage. If you’ve met up with fellow students or are travelling with others make sure you are not sitting in one if you wish to chat during your trip. If you are in a quiet carriage you cannot hold a conversation, play music too loudly (even with headphones) or make a phone call. 6. You will be getting off at Hamilton Station (the stop before Newcastle Interchange), please listen out for announcements. 7. At Hamilton Station you will arrive on Platform 2, make your way to Platform 1 to change trains to Waratah Station towards Maitland. You do not need to “tap off” your Opal Card at this point. 8. Waratah Station will be the next stop and is less than 5 minutes away. 9. Get off at Waratah Station and we will be waiting to pick you up! Make sure to “tap off” your Opal Card as you exit station.